If you’ve spent any time in marketing discussion groups, you’ve probably heard how difficult it can be to get Facebook to approve your ads … depending on which industry you’re in. But when you look at ads from Facebook’s point of view, things seem a lot more reasonable. When you understand this perspective, you will see how seemingly small nuances in your writing can make the difference between ads that run and get you results … and ads that no Facebook user will ever see. By the way, just so we’re clear: I am not a representative of Facebook. The advice I’m giving you here is completely from the perspective of a marketer who writes ads for their platform. And the copy examples are just to show the concepts — don’t take them as word-for-word prescriptions. Also, I’m not really going to talk about “tricks.” Instead, I’ll show you a few ethical, effective strategies that I’ve seen work well. Cool? Okay … let’s do this. As every United States senator now (hopefully) understands, Facebook makes money by running ads. The more time you spend on Facebook, the more ads Facebook can show you. The more comfortable you are on Facebook — the better your “user experience” — the more time you’ll spend on the platform. Think of Facebook as an online cafe. People are consuming a product, but they’re mainly just hanging out. Now, imagine some guy going into a cafe, walking up to customers, and starting really invasive conversations. The customer, who was feeling great before, now feels embarrassed — called out for the acne they’ve been struggling with and hoped people didn’t notice. The customer instantly feels horrible. They were having a good time. Now they can’t stop thinking about their weight struggles. The customer is totally creeped out. How did this total stranger know that she’s 35 years old, lives in Denver, and is single without kids? If you owned this cafe, how long would you wait before you banned this intrusive jerk from your establishment? You’d bounce him as soon as you caught wind of this, right? Because if you didn’t nip this in the bud, your cafe would become known as a place to feel uncomfortable or even insulted. Clearly, this could drive people out of your cafe … perhaps never to return. The big difference, of course, is that on Facebook, the advertiser is the paying customer. But if people stop showing up to hang out, business will dry up. Advertisers optimize for conversions, website clicks, page post engagement, and other business goals. Facebook needs to optimize for retention. They need people to enjoy their time on Facebook enough to keep coming back again (and again). Allowing advertisers to make users uncomfortable and feel terrible about themselves would be a very dumb move on Facebook’s part. A lot of marketers struggle with writing ads that get approved because they treat Facebook like a more traditional copywriting venue. That can be a great idea if they’re on your turf — maybe reading your sales page or attending your webinar. But Facebook isn’t your turf. So when you interrupt someone’s news feed and start making assumptions about them on a sensitive topic, it comes across as invasive and insulting. It can also mean your ad will be disapproved. The more sensitive your topic is, the more finesse you need to apply to avoid making the user feel singled out. These mistaken notions arise from people not understanding why their ad wasn’t approved, and not having a good set of troubleshooting strategies when an ad gets disapproved. It’s not that the words “you” or “weight loss” are outlawed. It’s that when you avoid them, you are by default less likely to write an ad that comes across as invasive. But the inclusion of those words doesn’t necessarily make an ad invasive. And memorizing a list of “forbidden words and phrases” isn’t the ideal solution to getting more ads approved. It ties your hands creatively and limits the angles you can test in your campaigns. When I write ads for my freelancing clients, I aim to strategically strike a balance between saying what I need to say and preserving a positive experience for the Facebook user. Below are some ways you can do this in your own ads. As you will see, there is some overlap between the different methods. Use these approaches if you’re promoting offers that are difficult to get approved, or you’re having a hard time troubleshooting an ad that gets disapproved. I’ll use mostly health and fitness examples to show you what I mean. I know, I know. Writing too much about yourself usually makes for bad copywriting. I think so, too. But hear me out on this one. This tactic has been used heavily by coaches and personal trainers in the form of “Huge Opportunity” ads. I’m not sure of the original source, but I first heard of them from copywriter James Hepburn. Depending on how you handle them, these ads can sometimes be a bit over-the-top and hypey. But when written well, they’re often highly effective — assuming your audience hasn’t already been exposed to them ad nauseam. Here’s the key: By describing your quest for people in your target market, you can call out that target market in great detail without being invasive. Your writing for this type of ad should put a velvet rope around your offer. You’re not trying to sell somebody on your offer, you’re presenting the ability to take part in your program as a beneficial opportunity. Every aspect of your ad and funnel needs to maintain this velvet rope or it loses credibility. To solidify the framing of this velvet rope, you would also describe the benefits of your offer as requirements. The bullet points are the benefits of your product or service. The person responding to the ad needs to want those benefits in order to qualify. Another way to apply this method is to simply describe the results your company, product, or service will deliver. By describing the challenges others have encountered or the benefits they’ve attained, you can go deeper with your copy without being invasive. “Lisa was frustrated by those last 10 lbs. No matter what she tried, she just couldn’t lose weight. She was worried that having kids might have damaged her metabolism and she’d never feel confident wearing her old ‘skinny jeans’ again. You can also use this approach to talk about how your offer helps your target audience at large. This is an approach I originally learned from ad expert Mike Heath. With this approach, you write the ad from an educational angle, speaking to the reader’s interest in the topic, rather than calling out any problem they have. “FACT: 95% of people who go on diets fail to keep the weight off. But what about the other 5%? It turns out there are 3 simple behaviors that separate the 5% from the 95%. You can also apply this in a more straightforward, direct-response style by making it more about other people (as in Method #2). A great way to do this is to highlight the results of using your product or service. We’ve helped more than 244 men in Boston free themselves from back pain and improve their golf swing. So far, this article has focused on ways to talk to a Facebook user about sensitive topics without making them feel singled out. This has been done by strategically avoiding “you” language. But what if you really do want to talk directly to that reader? Depending on your offer and topic, you might need to talk about benefits or challenges in less abrasive terms. You can also frame your message in a way that imbues vague language with additional meaning. That could mean any number of things, right? Lower blood sugar, improved heart health, weight loss, etc. In that case, the references to being annoyed by hearing about the keto diet and not wanting to count calories or swear off carbs creates a context. Within this context, the vague benefit of getting healthy now has a more distinct meaning of losing weight. You can also use words or phrases that act like a “secret code” for your target audience. For anybody else, they’ll fly under the radar. But the right person will pick up the context for the message you’re conveying. For someone who hasn’t tried Weight Watchers, that sentence will be relatively meaningless. Facebook ads are a distinct form of copywriting with their own set of challenges. But you can navigate those challenges when you understand Facebook’s perspective and write your copy accordingly. Facebook’s rules are always subject to change. Individual phrases that are fine today might result in ad disapprovals tomorrow. But their objective is steadfast. Facebook optimizes for the user experience. They want to create the kind of great user experience that keeps people coming back. By staying mindful of the potential impact your language may have, you’ll have an easier time writing effective ads that get approved … and troubleshooting them when they don’t. Ever have a frustrating time with Facebook ads? Let us know about your experience in the comments! 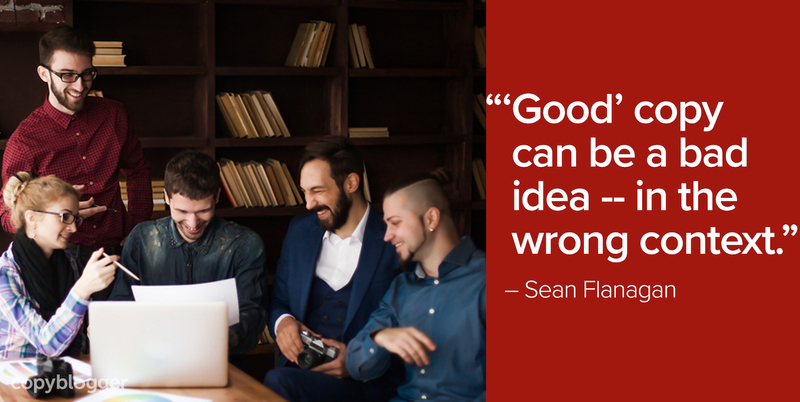 Sean Flanagan is a Copyblogger Certified Content Marketer specializing in Facebook advertising and copywriting. He works primarily with coaches and businesses in health, fitness, and wellness, both B2B and B2C. I shut down my Facebook account months ago, but this is good advice for any form of advertising. I found this to be a great fresh look at how to work with the giant, Facebook. Getting a glimpse of advertising content from their perspective is helpful. Helpful information for anyone wanting to succeed on Facebook. Thanks for sharing! Love your holistic take on this topic, Sean. Might just be the way my brain works, but aligning my approach with the larger objective is a lot more helpful than trying to stick to a set of ever-changing rules. As well, I agree with Michael—definitely applicable across many platforms. Great piece.